NATURA’s story began over 15 years ago when Founder Rafaela Chagas first moved to the U.S. from Brazil in 2004. Rafaela’s dream was to bring a piece of home with her by opening her own Spa. Her mission was, and is, to share the real Brazilian Sugaring Melt technique straight from Brazil. To achieve the tremendous success Natura is enjoying today, Rafaela had to come a long way. With difficulties communicating in English, she first went to English school for about 2 years. To support herself through school, Rafaela began to wax and sugar her friends from English school (majority Brazilians), and very rapidly Rafaela became so busy that she could barely return phone calls. Her popularity grew among the Brazilians as her friends had finally found someone who could provide the authentic Brazilian Wax and Sugaring technique found in Brazil. In 2006, she went to San Diego Mesa College, and later she proceeded to get her Bachelors in Business Management with emphasis in Entrepreneurship that was a very busy and overwhelming time for Rafaela, as she would be able to only see clients 2 days a week while going to school full time. Being someone who is very motivated, dedicated and committed to her endeavors, she proceeded to get her Bachelors degree and decided to take extra classes during Spring and Summer breaks, so she could achieve her goal which was to graduate from San Diego State University by the end of 2009. In February 2010, a few months after her graduation, Natura’s first location in San Diego became a reality. 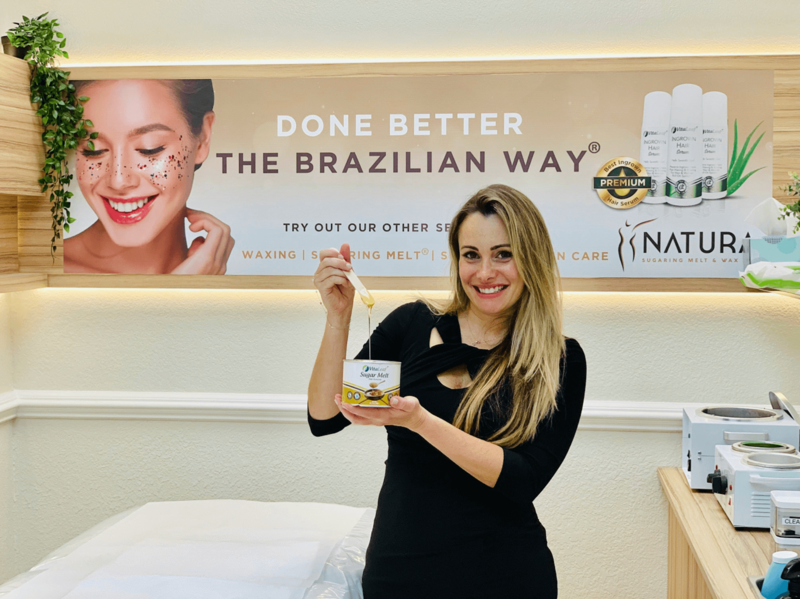 With the help of some friends, Rafaela and Marcio (her husband) transformed with their own hands an old real estate office into a beautiful skin care lounge & spa, where the main focus was, and is, the art of the Brazilian Sugaring Melt and Wax. The rapid success of NATURA was so extreme that clients would come from all over San Diego and even some from Tijuana, just to try Natura’s estheticians and Rafaela’s technique. In less than 6 months, Natura expanded and took over the adjoining suite. NATURA was one of very first salons focused primarily on hair removal in San Diego, and probably the first one to offer among their blend of waxes, the extraordinarily popular Sugar Paste (a famous combination of sugar, lemon juice & water). For all these years until about 2016, Rafaela and her husband used to make their own Sugar Melt which was used at all Natura locations. Finally, Today, NAtura’s exclusive Sugar Melt formula is now manufactured by a Company that supplies this products to all current and upcoming Natura Franchise stores. We are proud to say that we have truly pioneered the art of Sugaring ‘from Brazil’ years before it became so popular. Therefore, to differentiate our unique Sugaring Melt technique from Brazil to the regular Sugaring (Egyptian technique), Natura took an extra step and obtained the Trademark of our Sugar Melt Product and the Unique Sugaring Melt technique from Brazil. To understand the difference in both techniques CLICK HERE. Today we offer our clients a variety of different waxes that are very gentle on the skin as well as our sugar melt product. Natura performs an authentic 3-step method technique for every Brazilian Sugaring Melt & Wax service, which is Natura’s Signature technique developed by Rafaela over the years and our clients love it. The use of the Sugar melt product and the different waxes used on different parts of the body is the key to a fast and precise result while respecting our client’s skin. Due to the continued dedication of the amazing team of Natura Estheticians and Front desk Coordinators, Rafaela and her Management team, NATURA was approved by the Federal Trade Commission (FTC) to Franchise their Business Model. Rafaela and Marcio have 4 kids and are currently expanding their business in Florida. NATURA has grown to open 7 locations all the way from San Diego, CA to Ft. Lauderdale, FL. The last two having recently Opened in 2019. Over the past 9 years, Natura has prioritized customer service to earn a stellar reputation and we are honored to have clients travel from all over just to experience our services. We have been voted San Diego’s #1 hair removal salon for several years running and always go the extra mile to earn and maintain that status!